From Suvarnabhumi Airport to Samui Airport, these are Thailand’s most passenger-heavy airports – and how to navigate them. After a long flight, getting lost in an airport or finding trouble arranging transportation to the city can be a nightmare. 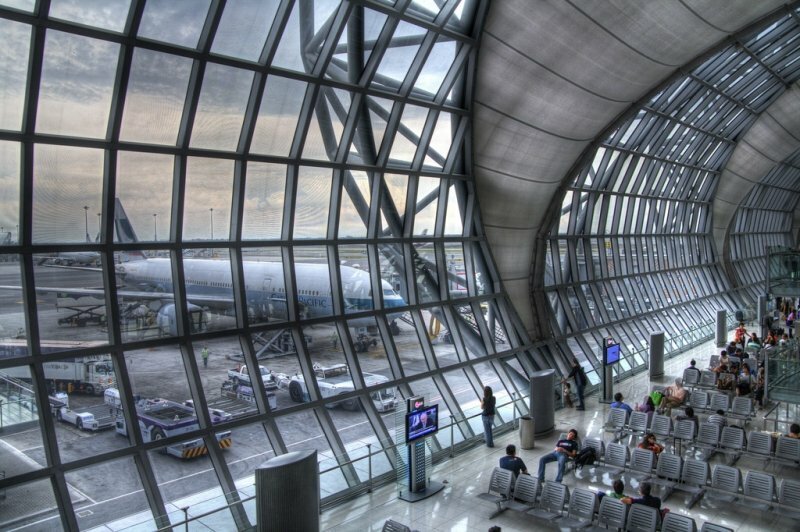 Here’s a guide for the six biggest airports in Thailand so you can kickstart your next trip to this vibrant country smoothly. 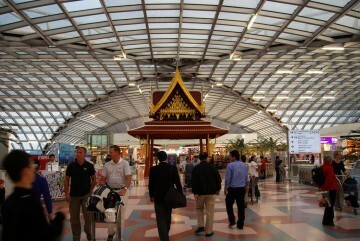 Suvarnabhumi is one of the two international airports near Bangkok City. 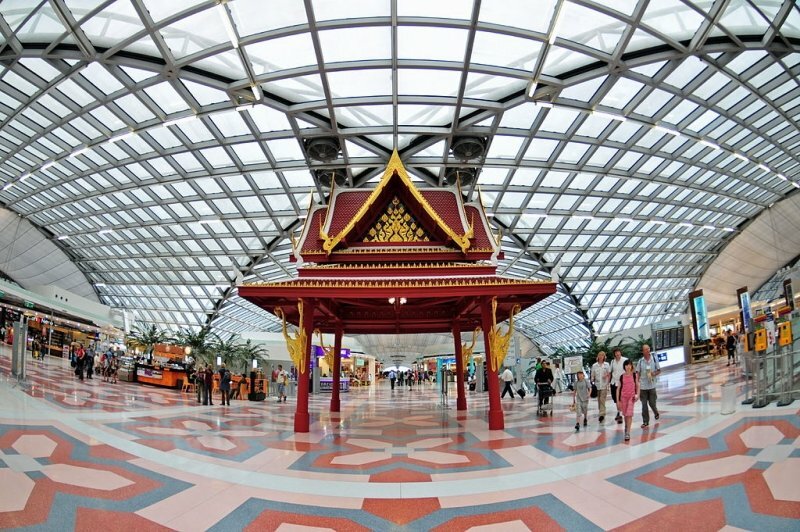 Ranked among the busiest airports in the country, Suvarnabhumi Airport is the hub for over 100 carriers, including all Thai-based airlines, and 95 cargoes. The airport is located 25km away from the city centre. 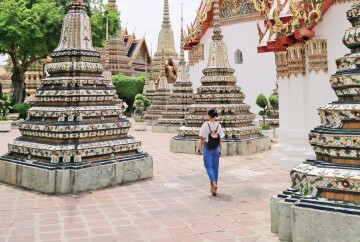 Travelling to the heart of Bangkok (eg. the Democracy Monument) from Suvarnabhumi Airport can take up to one hour by car or bus. The terminal building juxtaposes international and domestic terminals, assigning them to different parts of the concourse. There are also two parallel taxiways allowing multiple plane landing at the same time. Within the building, besides common waiting areas and duty-free shops, there are tourist agencies and other facilities such as restaurants and smoking or smoke-free lounges. Other conveniences include money exchange stations and day rooms. Public transport: The new airport railway allows passengers to depart/reach the terminal building from the city. Meanwhile, the SRT also provides service from Hua Takhe (the closest station on the East Line) to Rangsit city. As for bus services, three bus routes operate to serve the alighting passengers from the terminal building. Automobile: The most common way to get to the city is to take a cab on the Motorway 7. This ride may take up to one hour with no traffic jams. 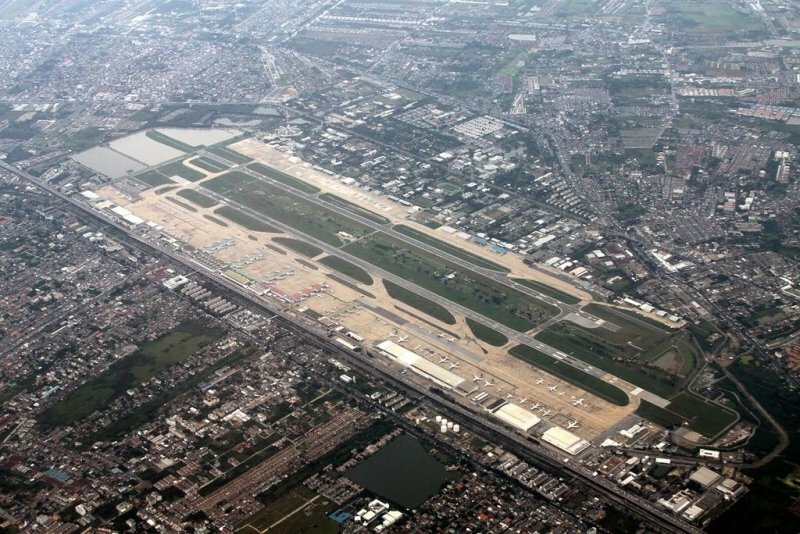 Beside Suvarnabhumi Airport, Don Mueang Airport is the second international airport that serves Bangkok city. Unlike Suvarnabhumi Airport, however, Don Mueang Airport hosts budget airlines. The airport lies 28.4km to the east of the city centre. Public transportation services around Don Mueang are satisfactory and available for most of the day. Don Mueang Airport has three terminals. Despite its slight desolation, the airport affords basic services such as waiting rooms, restaurants, shops, money exchange offices, tourist agencies and taxi offices. Other transportation options beside taxis are located outside of the terminal building, but within walking distance. Public transport: Cheap buses are available outside the building and they depart at the frequency of every fifteen minutes. One can opt to catch these buses, which cost 60 baht/person, to the nearest SRT station and take the train to the city. Travelling this way takes more than one hour. Automobile: Alternatively, you can queue up for taxis or book one from the taxi offices inside the airport. The ride is short (less than an hour) and the fare is approximately 350 baht per ride. 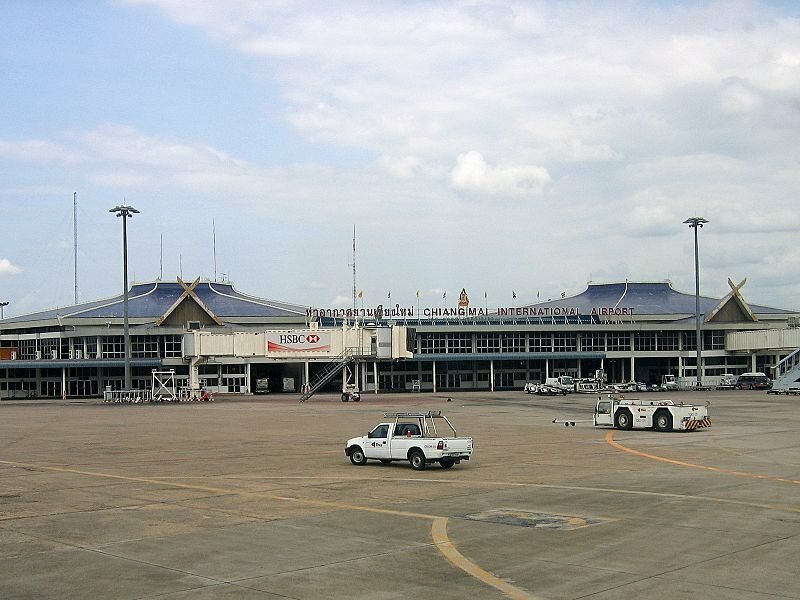 Chiang Mai International Airport is now the second main hub for AirAsia and it is the fourth busiest airport in Thailand. With its recent expansion, Chiang Mai International Airport now operates 24/7 and can service a larger number of passengers. 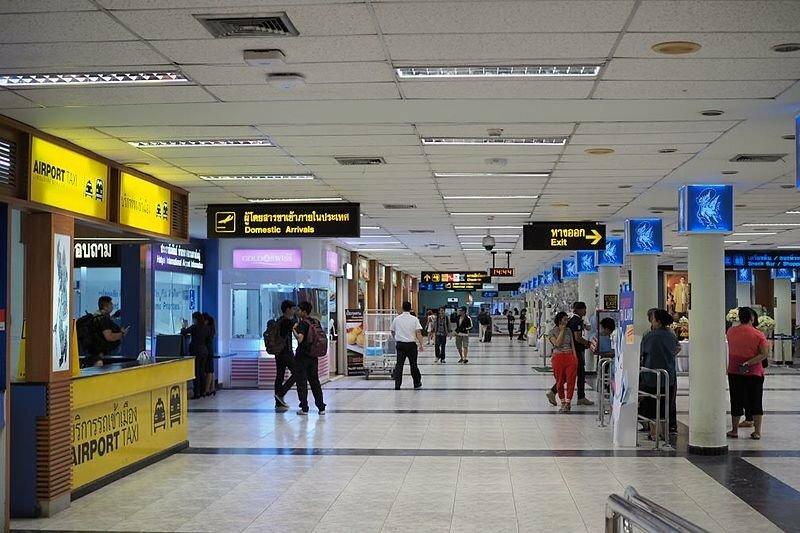 Located 4km southwest of downtown Chiang Mai, Chiang Mai International Airport is connected to the city area via the Super Highway and Chiangmai–Hod Road. Transportation services include taxis, tricycles and rental limousines. All are well organised and can be found outside the building. The building comprises two levels, with the departure area at the upper level and the arrival area at the lower level. Restaurant outlets, cafes, shops and function counters are available on both levels and are in good condition. Public transport: Tricycles (tuk-tuks) are available outside the terminal building for 50 baht per ride. Automobile: Transport services are very well-organised here. Taxi services are regulated based on systematic price meter by the airport and the taxi companies. Travellers can also rent limousine and taxis at the counters on the first floor or wait for pick-ups from their hotels at the terminal building. A ride typically costs 120 baht, with additional fare for limousine services. One of the busiest airports in the country thanks to the large influx of tourists into this beautiful resort destination, Phuket International Airport is a thriving hub for international and domestic flights. 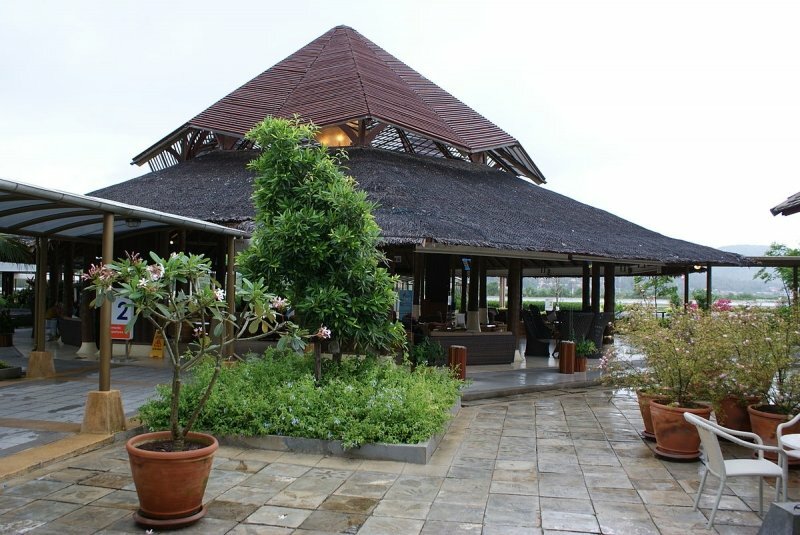 Serving the city of Phuket, the airport is also an attractive venue for tourist agencies. The airport is located 32km away from the city centre. The airport has two separate terminals, with Terminal 1 reserved for international flights and Terminal 2 for domestic flights. There is also a Terminal X for chartered flights. Currently, there is an expansion that will provide more space for cargoes and police parking lots, on top of higher quality interiors for the terminal buildings. Within the terminals, there are restaurants, tourist agencies and transportation counters. 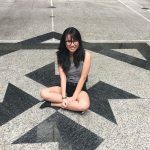 Public transport: Airport buses are provided from 6am to 10pm, with various stops in the centre of the city such as Indigo Pearl, Talang, and the Heroines Monument. The bus station is on the first floor of the arrival hall. 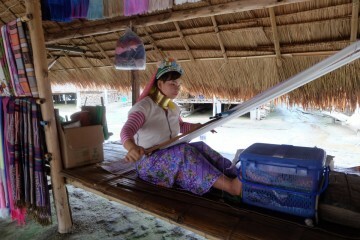 Prices range from 30 to 50 baht. 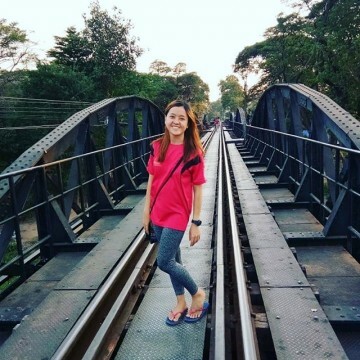 Otherwise, one can hop on the local bus at the Phuket Bus Terminal and catch a ride to their desired destinations for a different range of fares. Automobile: Travellers can check with their hotels for pick-up services or book themselves a taxi right outside the building. There are also taxi counters inside the building, but they charge a little bit extra. The frequent gateway for Muslims in Southeast Asia who are departing for their pilgrimage to Mecca, Hat Yai is among the busiest airports in Thailand. It can serve up to 2.5 million passengers annually, at it does so at the rate of 30 flights per hour. The airport is 14km away from the city centre, and is connected to the urban area via Route 4135. The international and domestic halls are co-located in a two-storey building. While departures, international and domestic, are handled on the lower level, the arrivals are processed on the upper level. Inside the building, transportation counters and money exchange services are provided, on top of restaurants and duty-free shops. Public transport: Songthaews, a type of pick-up truck, will be waiting outside the building and rides cost 30 baht. The last songthaew departs around 8pm. You can also opt for minivans, which operate for longer working hours at the price of 100 baht per ride. Automobile: Otherwise, tourists can choose to travel to the city by taxi (250 baht) or a limousine (300 baht). As Krabi becomes a popular beach destination in Thailand, Krabi International Airport will be undergoing a series of renovations starting 2017. The airport terminal, which has been congested, will be revamped next year to accommodate an increasing number of domestic and international flights. 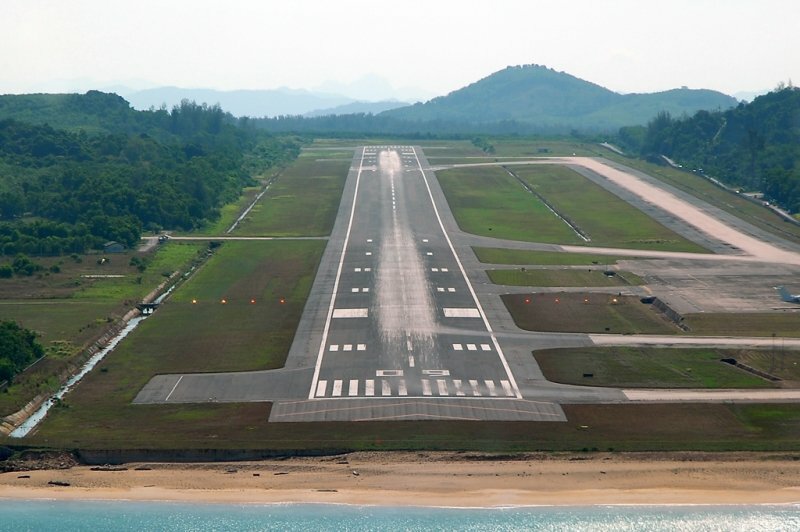 The airport is located 17km from the city centre and 27km from the famous Ao Nang beach. This is equivalent to a 16-minute car ride or a 30-minute bus ride. Arrival and departure halls are inside the four-story building, along with other services such as money exchange offices, eateries and souvenir shops. Above the departure area are airline offices. Authorized pre-paid taxis are available at the arrival hall. Public transport: Since no public transfers are allowed into the airport grounds, passengers can take the airport buses to reach the Krabi Town or Ao Nang Beach for 90 to 150 baht per person. The buses only leave five times a day, which is why it is imperative to check the schedule carefully before arrival at the airport. Automobile: All automobile including taxis and car rental services are regulated by the airport and pre-paid. In order to book a taxi or a car, one can contact the booths inside the terminal building for coupons. Otherwise, one can arrange hotel pick-ups. No unauthorized taxis are available at Krabi Airport. Transfer services (minivans) are also provided. Prices are charges according to distance and all rides are private (passengers would not travel with other passengers). Probably the most interesting airport in Thailand, Samui International Airport is a private-owned property constructed by Thai Airways. What is special about it is that there are no indoor areas save for a small gift shop, and that the exteriors are comparable to a garden. Even without standard infrastructures, the airport is one of the busiest airports in Thailand to date. Samui is located 2km away from the main city. The airport has two terminals, one for international flights and the other for domestic flights. The two terminals are 50 metres away from one another and both are built as resort-style huts instead of concrete buildings. Public transport: Samui Airport is 5km away from the Big Buddha Pier, where ferries come and go to Ko Pha Ngan. Meanwhile, high-speed ferries to Ko Tao and Chumphon can be caught at Maenam Beach Pier, which is 6km northwest of the airport. Automobile: Taxis and pick-ups are provided at the airports, along with basic car rental services.